*Corresponding author. Tel. : +01 734 4877588; fax: +01 734 4875394. E-mail address: yxie@emich.edu (Y. Xie). 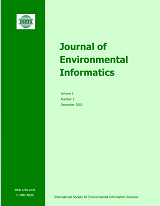 Assessment of ecosystem responses to coupled human and environmental impacts is increasingly acknowledged as an important research of environmental informatics. However, current ecological and environmental models are not effective for capturing the coupled influences due to prevalent approaches of separating human interferences from environmental changes, common uses of time-averaged or cumulative data, and the lack of efficient methods integrating environmental observations with socio- economic statistics that are tabulated over different spatial units. In this paper, we presented an integrated modeling framework to tackle these limitations. We developed data-assimilation techniques to integrate ecological and climate data with socioeconomic statistics into a coherent dataset on the basis of conforming spatial units. These data were used in panel regressions to estimate responses of grassland productivity to coupled climate factors (seven) and socioeconomic indicators (ten) across 37 counties for nine 16-day growing periods each year from 2000 to 2010. We also advanced the analysis of climate impacts by allowing for quadratic rather than linear impacts and by incorporating lagged time effects for the dependent variable. The case study was conducted in Inner Mongolia Autonomous Region of China. Our findings provided strong evidence that the grassland productivity responded significantly to variations in both climate factors and socioeconomic variables; displayed significant seasonal, annual, and regional variation; and revealed cumulative influences from prior climate conditions and extreme climate fluctuations. The assimilation of climatic, ecological and socioeconomic data into a big-data set and the application of multi-spatial-and-temporal panel regression model were much more comprehensive than prior studies.